Searching for the reason Rolf wasn't in this comic. The special guest star at the theater is Howlin’ Jack Talbot, and the Electric Mayhem, especially Animal, is looking forward to it. Unfortunately, Talbot keeps disappearing midsong, with a dog on stage when he does. When Talbot’s secret is discovered, Animal is willing to risk his life to save him. Skits include Talbot’s musical numbers, a chicken trying to play the wolf in Red Riding Hood, Muppet Labs creating a hair growth formula, and another “Link Hogthrob, Monster Smasher!”. What they got right: It’s nice to finally get a “special guest-star” on the show, even if it isn’t a real life celebrity. This was probably my favorite “Monster Smasher” story. What they got wrong: As I keep saying, musical numbers don’t work in a comic book unless you know the music to go with it. You can imagine that “Monster Mash” matches up with “Monster Munch”, but the songs are too different. Recommendation: It’s still worth picking up, but probably not the issue to start on. Get some of the others first, if only this arc, and then you’ll enjoy this issue better. I think the bullet was just scared of Animal. Most people are. 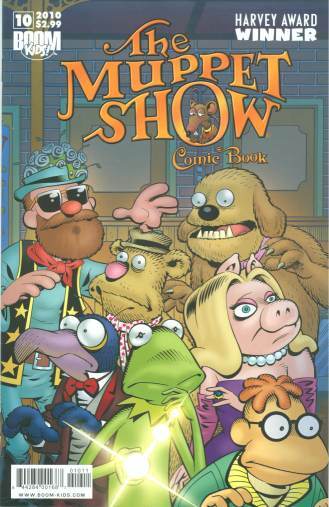 Posted by ShadowWing Tronix on October 7, 2010 in Television Spotlight, Today's Comic and tagged Link Hogthrob, Muppet Show, Muppets, Roger Langridge.